As the birthplace of the Italian Renaissance, Florence lies in the heart of Tuscany, buzzing with modern life but never forgetting its historical legacy. Florence, a sister Trollbead to Milan,is a soft green with textural buds of clear glass with highlights of tan and beige, giving it the "Trollbeads" signature sense of depth, a difficult accomplishment in lampworked beads. The designer is Lisa Aagaard. The Florence Trollbead was released in 2009. Retired in 2018. 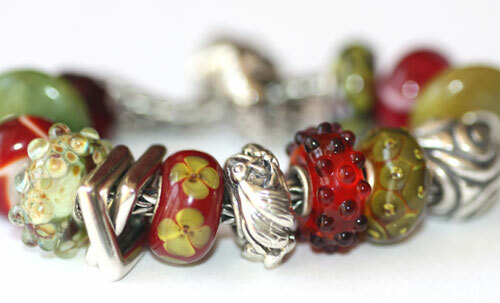 The Florence Trollbead when used on an Olive and Red Trollbeads bracelet. Click the button below to add the Florence Bead, retired to your wish list.